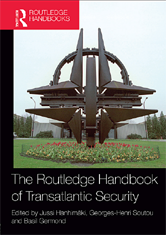 This new Handbook provides readers with the tools to understand the evolution of transatlantic security from the Cold War era to the early 21st century. After World War II, the US retained a strong presence as the dominant member of NATO throughout the Cold War. Former enemies, such as Germany, became close allies, while even countries that often criticized the United States made no serious attempt to break with Washington. This pattern of security co-operation continued after the end of the Cold War, with NATO expansion eastwards extending US influence. Despite the Iraq war prompting a seemingly irreparable transatlantic confrontation, the last years of the Bush administration witnessed a warming of US-European relations, expected to continue with the Obama administration.